One of the highlights of the Fall season for me is when a bunch of us old WTOP/CBS radio and TV staffers get together and tell each other how young and beautiful and important we all were back in the 1960s. 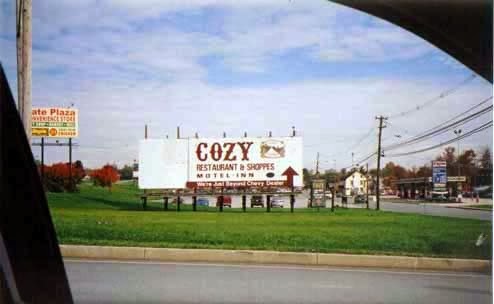 We meet and have these "Lie" sessions every year at the COZY INN in Thurmont, Maryland. That's where CAMP DAVID (the President's retreat) is, and the reason it's held there is because our engineering and production crews spent a lot of time there covering the Presidents. It's about an hour outside of Washington in the Cotoctin Mountains of Maryland, which is a beautiful place to enjoy Nature's Fall show. members themselves. each standing and telling a personal rememberance of those "glory days." Long time announcer, Don Richards always has a story that is hard to top. I think you will enjoy his telling about the time he introduced a Nationwide speech over CBS by President Eisenhour.